SOCA go after pirates - Read all about IT! 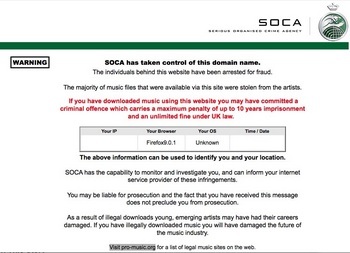 The Serious Organised Crime Agency (SOCA) has recently taken control of RnBXlusive.com after the music website was accused of hosting music illegally. David Cook, a cyber crime expert at law firm Pannone, who previously defended individuals in the FileSoup filesharing case last year spoke to ComputerWeekly about his take on the closure. “For example, Spanish Courts seem to suggest that peer-to-peer networks are ‘mere conduits’ for the transmission of the data and therefore not liable. This “mere conduit” point arises out of the EU Electronic Commerce Directive 2000/31/EC, which has been effected by the EU member states. This defence applies in UK law as well. “It was therefore my opinion that the prosecutorial and investigative failures in the UK had directly resulted in the attempts to extradite O’Dwyer to the US. Simply put, “If we can’t successfully prosecute in the UK, find a way to get them somewhere where we can prosecute them successfully”. However, this conspiracy theory of mine may have been entirely wrong – News has reached me recently that the RnBXclusive site has been taken down by the UK Serious Organised Crime Agency and the host has, apparently, been arrested.